The best short walk in the Park! Cruise by water taxi to Anchorage then take an easy walk around the Pitt Head Loop Track via the most beautiful beach in the Park: Te Pukatea. 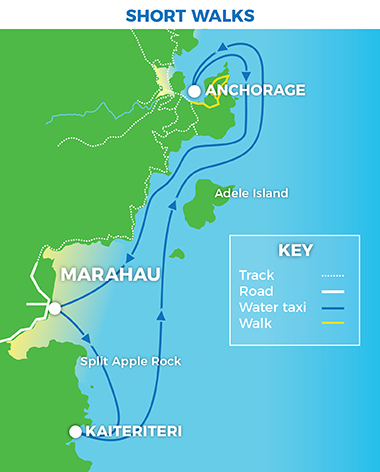 Cruise info: Marahau to Anchorage: 45 min. Anchorage to Marahau: 45 min. Catch a water taxi into the Park, walk the Pitt Head Loop and/or chill out on the beach.